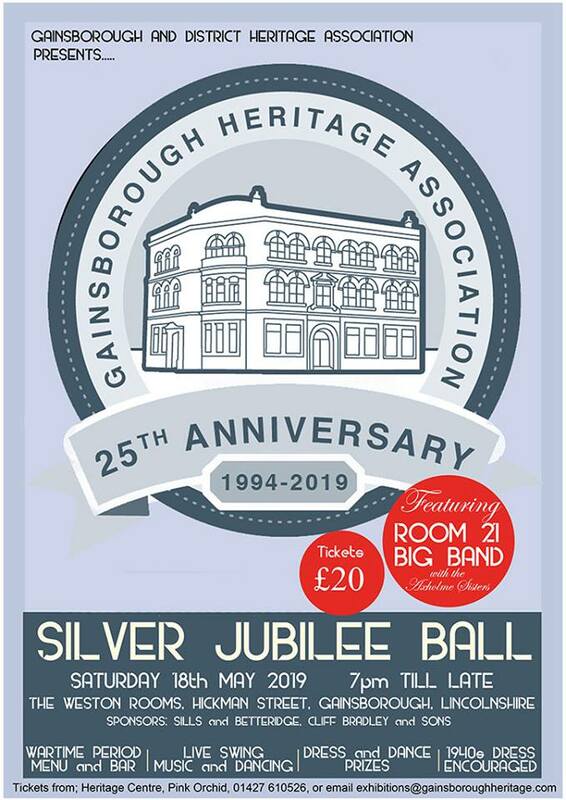 Join the team on Saturday 18 May to celebrate the twenty-fifth anniversary of the Gainsborough Heritage Association with Room 21 Big Band playing exciting 40s music all night long featuring the Axholme Sisters. There has always been a call for a local history museum in Gainsborough, and thanks to the work of countless volunteers over the years Gainsborough’s local history has been preserved, remembered and protected. The Centre has developed fantastic resources, exhibitions and achieved amazing amounts through hard work and determination. So make sure you book your tickets well in advance to dance the night away and celebrate the achievements and preservation of Gainsborough’s local history. The evening will take place at The Weston Rooms, 20 Hickman Street, DN21 2DZ, Gainsborough and doors will open at 7pm. The tickets are £20 each and include a two-course meal, and a chance to win with dance and dress prizes so pop down to the Centre and book those tickets now!!! For more information contact the Heritage Centre on 01427 610526 or email [email protected] or keep updated with the latest news on the Association’s Facebook page.